I have a circular level select screen. The icons for the levels will be different for different types of levels, and they're magenta to show an available level, green to show a cleared level and gray for a locked one. Did you get the ring idea from Secret of Mana? I'd recommend making the icons different in addition to the colors. I'm going to have a balloon item that triggers when you fall into pits and lifts you out of them, so you don't die and start over at the beginning of the level. Like McDonalds Treasureland Adventure. Maybe let people use balloons whenever? It'd kill some of the challenge if you could just fly over obstacles though. It worked for Hello Kitty World. Is the lava heating the air? I'm currently saving like 40-45% with dictionary compression on the script text. How are you organizing that? I never really played much of that game, I was really just trying to think of a cool, easy way to have the level list take up a lot of the screen space while standing out from most/all current NES games. Yeah, I should have the icons different in some way. At the moment the plan is to have a "!" for action levels and a "?" for puzzle levels but I feel like I should come up with something more graphical. Just nothing comes to mind yet. I tried drawing a puzzle piece but it came out crappy. I'm not attempting to make my game realistic at all. I'm just trying to make something fun that's a blend of a lot of games from when I was little, so I'm going to just use whatever tropes I think are fun. The dialog engine already keeps a buffer of the current line and builds onto it before drawing it because of the variable width font, so it wasn't much more effort to make $80 to $ff have special treatment and use one of 128 "words" to paste multiple characters onto the end instead. I used a list of common English words and kept count of how many times each word was used and how much savings each dictionary entry got me until I wound up with this list. In the dictionary table, the words are just one word after another with bit 7 set for the last character of each word, for maximum savings. When the dialog engine starts, it parses the whole table and builds a table of 128 pointers in RAM. If I wanted to use an extra 256 bytes I could just have a pointer premade in the ROM but RAM is less precious to me for this project. At the moment the plan is to have a "!" for action levels and a "?" for puzzle levels but I feel like I should come up with something more graphical. Just nothing comes to mind yet. When I read tepples's comment, the first thing that came to mind was an icon to show what the level will be, like a forest, volcano, etc. An outline for the type of level, like a puzzle piece shape, would be really cool, especially if there was a little graphic inside. About one in every 12 men has some level of color blindness. Color-blind men can see through camouflage better but have a harder time telling green from red in a video game. With the Z80 skills you learned on the TI-83, you may eventually want to port something to the Game Boy, which just has $0B, $1A, $29, and $38. 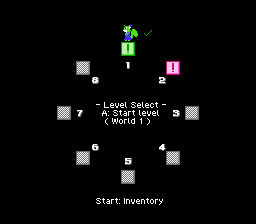 Unavailable levels are shaded out with a dither pattern and when the level you've selected has already been completed there's a checkmark by the player. Probably should have different icons for completed/available but I'll still have to make icons I like first before I see how I'll differentiate them. File comment: Top row: "puzzle"; bottom row: "action"
I've mostly been adding new enemies. Here we have the King from my SMB1 hack from 8 years ago, and Ronald, both taking the place Lakitu usually does. I included a demo with the first four levels. I think they might be getting too hard (like while making level 4 I had to make a health restore block and add some before it felt fair-ish) and I think I should do something about the fast enemy so it doesn't feel super cheap. I recommend just copying a fire ability and just keeping it the whole demo, lol. Honestly most of the game is done at this point aside from needing to design levels and other things, and minor work on other things like the dialog. Looks good. A bit hard in a few places. I like it when Nova says "Super M-" and the other guy says "Shh". I also like this enemy copying mechanism. Sometimes the firing won't work and I don't like how I have to walk slowly not to run into an enemy because I "duy". Can you program that the player can copy the running enemy's running ability which defeats all enemies the player runs into? After I copied the flame enemy's attack, I found that my attack destroyed all enemies, so I was disappointed that I could not try to stun + copy any other enemies. This ability persisted after death and even after a reset? Right now, Down+Select removes the current ability (as the sign says, but I should probably reword it to specify exactly what it resets), but I should probably change it to just Select to be more intuitive for people who have played Kirby's Adventure. 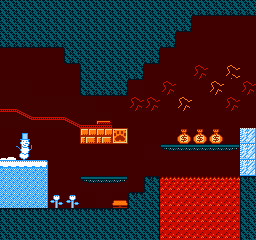 Most of the enemies in the early levels aren't copyable though, aside from the fire enemies and the volcano. I've been trying to figure out if getting hurt should remove the ability like in Kirby or if the player should just hold onto it because the levels were already hard enough as it is. I went with the latter, but I think I should just make the levels easier, especially for world 1. There's a limit to the number of projectiles you can have active at once, and any past that limit just won't spawn. It might be a good idea to just skip the animation for that if it's not going to work. I should probably also try to always leave room for some projectiles in the objects array. I don't have problems with the running speed myself, though I'm probably just really used to the game. The blue enemies that throw water bottles are very tough, especially because there is no pattern to their throws. The stun attack does not stop the bottles (shouldn't it? ), and the fire attack falls too quickly to effectively hit them (the water bottles have a lot more range). The only effective attack seems to be using their own weapon against them. 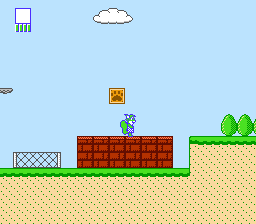 There are parts of levels where you have to stand near the top of the screen, but the squirrel is invisible there. File comment: Squirrel is hidden even though standing on clearly visible platform in centre. I can break bricks simply by pushing horizontally against them and jumping. Is this intentional? If I can do this it feels like I should be able to just punch bricks straight-on, but I can't. File comment: I can break blocks in a diagonal forward/upward pattern just by pushing against them. Might be good if instead of PLZ WAIT you showed the level's number so I know how far I've gone. Might also be nice if there was some way to return to the level select screen other than resetting the NES (maybe an "exit level" option from the pause menu? What is the "inventory" for anyway?). I never saw Ronald. Was he supposed to be flying on a burger somewhere? Is he in this ROM? Squirrel animates constantly on a ladder even if I'm not moving. Can jump on "goomba" enemies, but nothing else? Kind of confusing inconsistency. It seems strange that current weapon gets saved at checkpoints, so if you die you have to recollect it ONLY if you're still on the same level. Kind of unintuitive that you retain your weapon after dying only in some cases, especially since I don't really know what level I'm on while playing (the transitions are kind of immediate, and there's not level indicator). Per my earlier confusion about how to discard a weapon, it might be best if you just lose it when you die or reset the game. Speaking of reset, shouldn't there be some option to clear the saved game? Yeah, I'm changing the blue volcanoes to be less random (always one bottle every 64 frames) and I'm added some information in the tutorial level that has the player throw a fireball upwards to hit an enemy. Them continuing to throw when stunned is a bug. 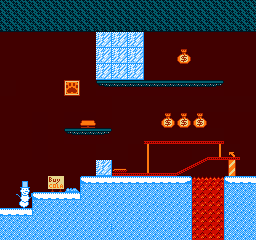 Later on in the game there will be things like using fire to melt ice and using water to put out fire. There's going to be a big emphasis on using abilities to interact with the level, like Kirby letting you cut ropes or light fuses, but on a bigger scale. I really need to brainstorm what ways I can make abilities stand out from each other though. Collision detection with blocks and handling for being off the top of the screen are both pretty iffy overall and need fixed. I actually should probably have some sort of animation before a level starts that shows off the current level number, and covers up that it's even loading at all during that time. Right now start+select (in that order. yeah, not intuitive) exits levels, but yeah, I should just explicitly add an option to the menu. I should try to minimize the number of button combinations in general. The will hold health recovery items, items that change the current ability, and things like keys in later levels that introduce those. I haven't really implemented those yet though. Buying these kinds of items will also give coins a use. I had him unkillable because I figured the level would be too easy if you could just kill him and move on with the level. I made him killable but lowered the level so it wasn't so high. Ronald is in the ROM but he isn't in any levels yet. Usually when testing out new stuff I just throw it on the intro level and take it out when it's done. I think I'm just going to take out jumping on enemies altogether to help distance my game from Mario. Abilities save because I wanted it to be where you could have another shot at the level with the same chances rather than being disadvantaged by losing your weapon. It probably doesn't matter though since it's so easy to just copy another enemy. Clearing the savegame will come when I add a screen between the title and the level select. And yeah, the last level is just a platform as a placeholder so that it doesn't go off the end of the selectable level list. Oh, that reminds me I noticed that down + select is order sensitive as well. Since I'm showing the game off on SMWCentral I figured I might as well show off the latest build here to show the project's not dead. Music now plays on lag frames, so there's no more stuttering when moving to another screen vertically. I've made an options screen, where you can choose faster acceleration (which doesn't really feel right to me) or a slower running speed, or double tapping to run (which lets you attack while walking, which is something I got a LOT of requests for) and finally the ability to reset the save. 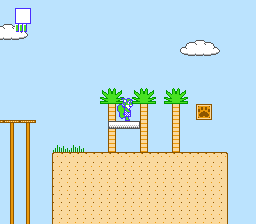 I've been drawing more graphics for World 1, going for a tropical theme and a garden/neighborhood theme. 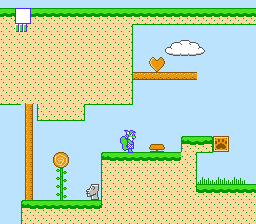 I have lots of graphics for World 2 (Bummer Club) but I don't really have mockups because I need to figure out how to put puzzles together. I should do that soon though since World 1 is nearly done. You can use bombs as platforms like in Pocket Bomberman but I feel like I reaaally need to nerf this because it's OP right now. Even if I make it so the explosions hurt you, you can still get up pretty high, which is probably okay. I put bombs in the inventory screen so you can play with them. There's also moving platforms, that can either move horizontally or follow a path. I redid the enemy spawning code, and now there's a priority system where an important sprite like a moving platform can remove a less important sprite to make room if it needs to. Sprites also no longer fail to spawn if they're on the screen you're starting on.